Water-based fragrances won't stain fabrics, carpets or upholstery. Eliminates odors and reduces new odors over time. Remember your scoop of delicious vanilla ice cream? Did you have it hand-scooped at the corner drug store, or placed in a bowl in your own kitchen? there's nothing like that first lick of the cold creamy treat, or the first brain freeze that came and went Soon after Chemical Guys Vanilla Bean Fresh Scoop scent is the air freshener for any fan of ice cream, milkshakes, and soft serve cold treats. The distinct vanilla flavor and scent is extremely complex, difficult to refine, and can only come from real vanilla orchids cultivated by hand. It is a true labor of love to hand-prune and pollinate every individual flower on the vine, but the sweet vanilla aroma and bold flavor make it All worth it. Chemical Guys master blenders took real vanilla extracts and mixed them with their patented odor eliminator enzymes. The end result is a flowery fragrant vanilla air freshener scent that destroys odors at their source. Mist a few sprays of Vanilla Bean Fresh Scoop in your musty car, stale living room, or stinky locker room to purge foul odors with the fresh scent of hand-scoopedice cream. Every foodie, kid at heart, and fan of delicious ice cream is sure to love Chemical Guys Vanilla Bean Fresh Scoop scent anywhere, any time. 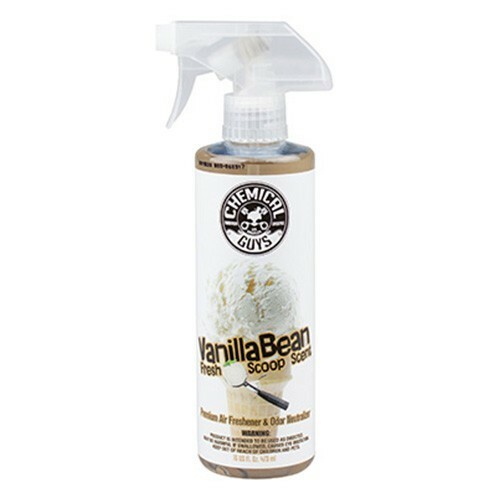 The Vanilla Bean Fresh Scoop Air Freshener & Odor Eliminator is a concentrated long lasting premium air freshener with natural enzymatic odor elimination properties to eliminate odor and reduce recurring odor. Use sparingly or dilute accordingly for superior air scents, and long lasting deodorizing ability. The Vanilla Fresh Scoop premium Air Freshener & Odor Eliminator can be used in conjunction with flushing your vehicle's AC system. The Vanilla Fresh Scoop premium Air Freshener & Odor Eliminator is used by professionals, automakers, OEM's, hotels, hospitality, management companies, home owners, auto detailers, auto dealerships, janitorial companies and house cleaners worldwide. Professionals understand the importance of the proper smell in its intended environment, hence supplying their customers with a true new scent that lasts is why they turn to Chemical Guys Professional Products. Geuren hebben veel meer doeleinden dan alleen het verdwijnen van onaangename geuren. Zo kan het invloed hebben op de denk manier van het andere geslacht. Ook kan het een verbetering zijn van lichaam en geest, doordat je een rustgevende geur om je heen hebt hangen. Vanille zorgt voor een unieke, maar subtiele geur die de geur van elke omgeving verbetert door het verstrekken van de vertrouwde geur vanVanille.